Gov. Gavin Newsom on Monday rescinded an order by former Gov. Jerry Brown deploying hundreds of California National Guard troops to the U.S.-Mexico border last year at the request of President Trump. Newsom called the situation at the border a manufactured crisis. "We are not interested in participating in this political theater," Newsom said. Of the approximately 360 National Guard troops stationed at the border, Newsom announced all but 100 will be redeployed by the end of March. 110 troops will be reassigned to help CalFIRE prepare for the upcoming fire season. Another 150 will begin working with the Guard's Counterdrug Task Force. "There are legitimate concerns in Northern California, particularly as it relates to illegal cannabis grows," Newsom said. "They're getting worse, not better." Newsom said he will keep 100 guard members at the border to focus on narcotics search and seizures. However Newsom said he’ll only keep those troops at the border if the federal government continues to pay for them. After a week of indecision, Brown reluctantly deployed the troops in April of last year after Trump asked governors of border states to help stop illegal immigration. However, Brown placed limits around the Guard's activities, refusing to let them help build the wall Trump has long sought. In his order, Brown limited the 400 National Guard troops to helping fight transnational crime, such as human trafficking and drug smuggling. "It will not be a mission to round up women and children or detain people escaping violence and seeking a better life," Brown wrote in a letter to Homeland Security Secretary Kirstjen Nielsen and then-Defense Secretary James Mattis. "And the California National Guard will not be enforcing federal immigration laws," he said, adding that the federal funding Trump promised "will allow the Guard to do what it does best: support operations targeting transnational criminal gangs, human traffickers and illegal firearm and drug smugglers along the border, the coast and throughout the state." Despite those limitations, then-Lt. Gov. 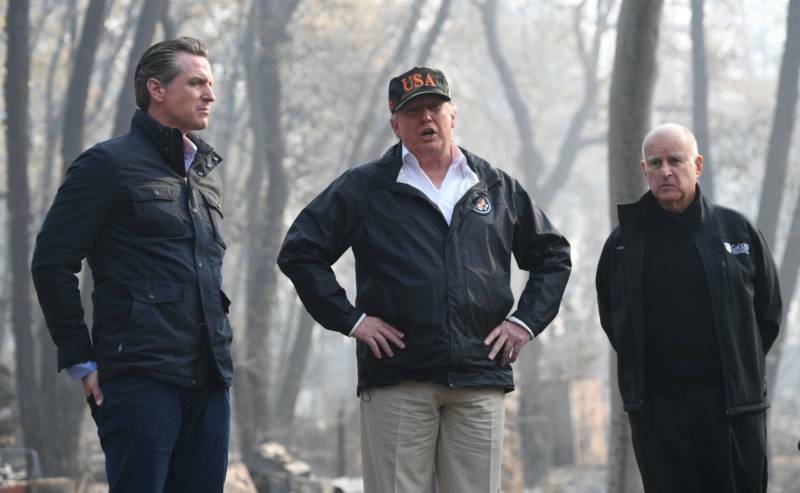 Gavin Newsom said at the time that he would not have complied with Trump's request had he been governor. Newsom's comments to the Sacramento Bee came during the 2018 campaign for governor. Newsom's move today comes as Trump is threatening to declare a national emergency and use existing federal funds to build a border wall if Congress does not allocate the $5 billion he is demanding. Over the weekend, Newsom tweeted that Trump's border wall "would be a waste of money because it wouldn't work, and it would be nothing more than a monument of stupidity." KQED has learned that in Tuesday's State of the State speech, Gov. Newsom will elaborate on his decision to recall the troops, saying "the border 'emergency' is a manufactured crisis." In prepared remarks shared by the governor's office, Newsom will say Trump's vision of America is "fundamentally at odds with California values." In rescinding Brown's order, Newsom is sure to attract the ire of Trump, which is not a risky move in a state where the president is overwhelmingly unpopular.